Clean Air Duct Freshener’s active CX22 formula safely freshens, cleans and coats the entire ventilation system – vents, ductwork, evaporator core, and drain pan. Clean Air® Duct Freshener’s exclusive odor encapsulation and surface control technology surrounds and neutralizes odor-causing molecules from mold, mildew, algae, smoke, food and pets – eliminating odors at their source for long-lasting freshness. Clean Air® Auto Fogger is a one-shot total release fogging freshener treatment for the interior of your car, truck, RV and boat. The MicroMistTMfog reaches throughout your car’s interior, penetrating into hidden spaces to safely and effectively eliminate odors. Clean Air Auto Fogger’s 2X system encapsulates odor causing molecules & stops odors at the source. 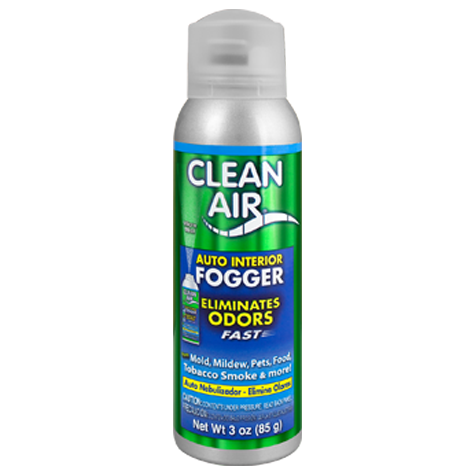 Clean Air® Auto Fogger’s mild clean & fresh scent dissipates in a couple of days leaving lasting freshness.